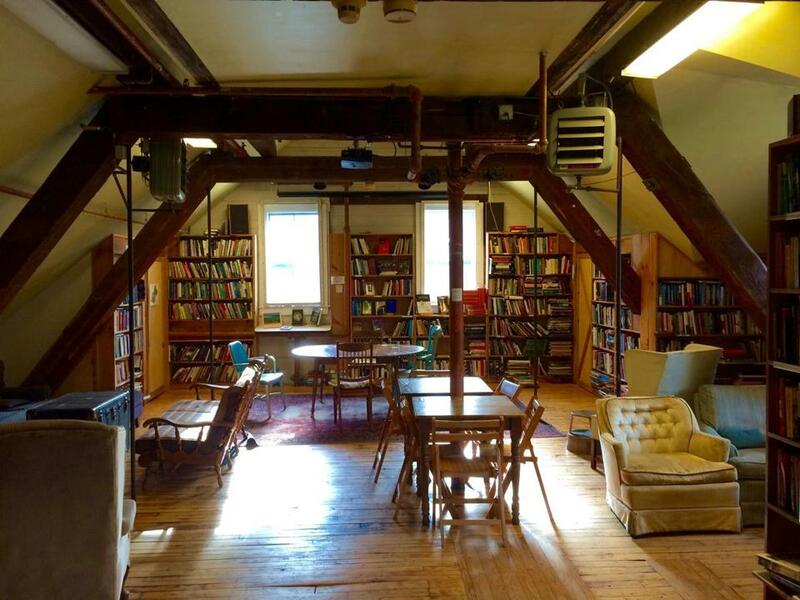 When first entering the Bookmill, you are greeted by its expansive nonfiction area. MONTAGUE — Part treehouse, part shopping center, part historical site, and part dining destination. The Montague Mill is impossible to categorize. But it’s entirely cool and timeless. Nice views, used books, and good food don’t go out of style. The mill serves a diverse clientele including families seeking a fun day out, tourists, and college students longing for a quiet place away from the hustle and bustle of their busy campuses. Five businesses share the space on the banks of the Sawmill River, which flows into the Connecticut River a few miles downstream. The Montague Bookmill is the cornerstone store. Open since 1987, it occupies the most space, and has been owned by screenwriter Susan Shilliday since 2007. Home to more than 30,000 used books, the store is far more vital than its slogan — “books you don’t need in a place you can’t find” — would suggest. The shelves are overflowing with books about every imaginable subject, and there are many nooks to peacefully settle in, as Shilliday often did herself when visiting her older daughter at nearby Hampshire College. “I just fell in love with this place and the area,” she says. Benches on the boardwalk outside of the Montague Mill, which sits on the Sawmill River. Shilliday says summer and fall are the busy seasons at the Bookmill, which is built for browsing and happening upon a great find at a discount. Because of the number of students in the area, Shilliday is able to carry more academic books than the average store, and has impressive history, philosophy, fiction, and art collections. After some shopping and reading, feed your appetite at The Lady Killigrew Cafe, which is connected to the Bookmill. 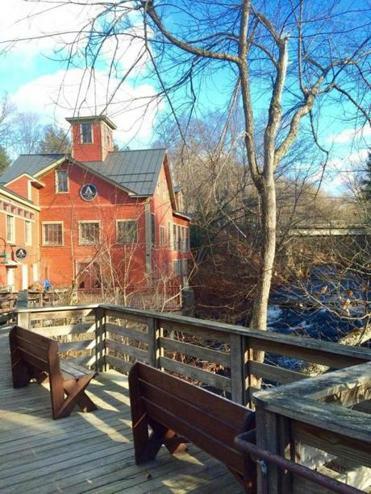 Overlooking the river, it offers coffee, beer, wine, salads, and an especially delicious breakfast sandwich, and serves as a prime spot to indulge in the mill’s free Wi-fi. Additionally, there is an upscale restaurant, The Alvah Stone, with seating on an outdoor deck during the warmer months, as well as Turn It Up!, one of a small chain of CD and DVD sellers. Sawmill River Arts is a gallery selling works from its 15 member artists. The outside the mill, there’s a boardwalk along the river with benches. Wooden staircases lead down to the river. According to Shilliday, the mill operated as a mill for grinding flour before converting to a machining mill, which assembled — among other things — the mold used to make machines that produced Louisville Slugger bats. Because the mill survived into the 1980s, the owner says former workers will occasionally stop by and share tales about the building’s previous life. Shilliday says she isn’t surprised people often make the 90-mile trek from Boston to visit her shop, considering how unique it is and how appealing its surroundings can be. “It’s such a beautiful spot. This place just feels right,” she says.